Funniest Movie Scenes: Although it would be impossible to compile a list of every single funny scene ever screened because selections and choices can often be entirely subjective, this collection moves towards the goal of collecting together the "greatest funny movie moments and scenes" from the most classic comedy films. 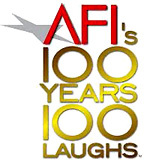 The following illustrated list presents a solid collection of the 'funniest' scenes in movie history from the most classic comedies, including film scenes from the silent era, the classics of the 30s (the Marx Brothers, Laurel and Hardy, etc. 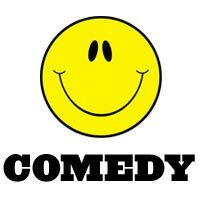 ), through to some of the best comedies of today. 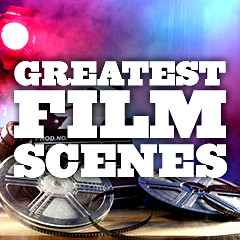 Some are scenes from other genres (drama, horror, science-fiction, etc.) that provide comic relief. They include slapstick, parody, screwball comedies, romantic comedies, black comedies, satire, farce, and films with witty dialogue. Most of these suggested scenes are quotable and/or cause smiles - they are often 'laugh-out-loud' funny, universally hilarious, and hold up for repeated viewings. 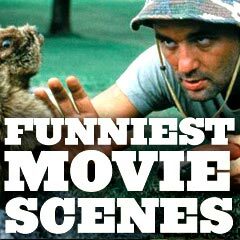 Many sites and comedy film books have attempted to compile listings of the funniest scenes or funniest comedy films in film history.